High-tech security cameras are all the rage nowadays. You know the ones I'm talking about, they sync up with your phone and home assistant devices to alert you if an unwanted intruder is approaching your premises. They're practical and cheaper than hiring a full-blown security company to monitor your house, and they even make for hilarious memes when they're used to their full potential. 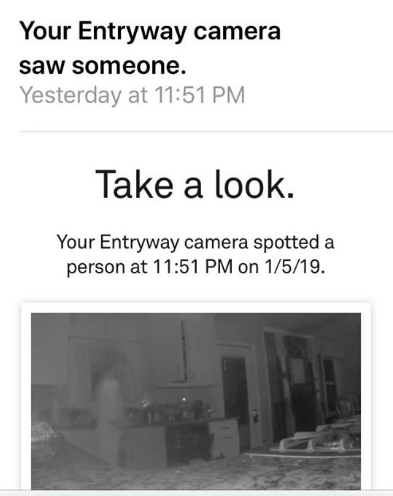 But what if you're not just punking your roommate into thinking that there's an intruder at your house, and you actually spot someone in the kitchen in real-time, on camera? It's a situation not unlike the one Jennifer Bryant Hodge, 57, found herself in earlier this month. In a post she shared on Facebook, she explained how she and her youngest daughter were enjoying a show together in her bedroom, when she got an unexpected "notification from our Nest security system." It said, "Person Spotted in Entryway" from 11:51 p.m. and it recorded until the two noticed it at 12:18 a.m. But it wasn't a scary burglar trying to rob the women as they slept. Instead, Jennifer is convinced their late-night visitor was her late son. "For everyone who knows what my son looks like, they know that this look just like him — beard and all!" 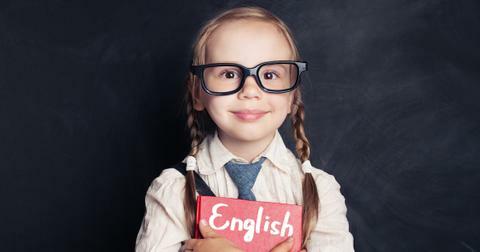 she wrote in her post. "When I went to the kitchen, the Nest camera was in flip-out mode," she continued. "I thought it was broken." 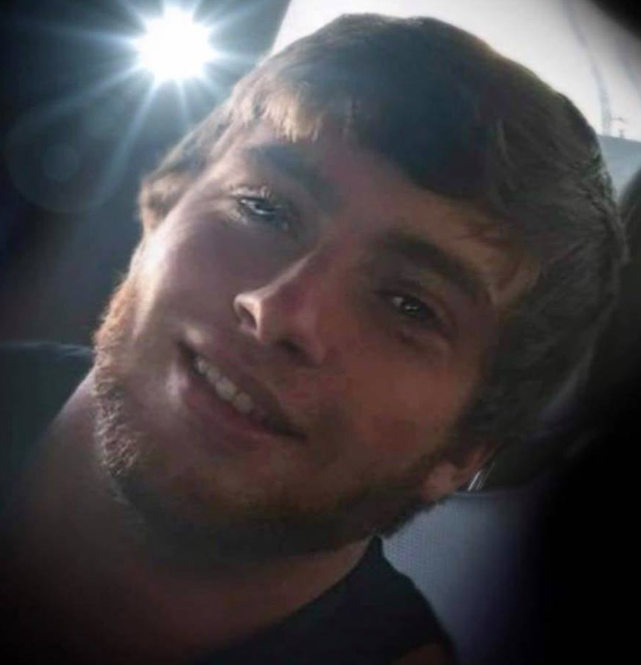 The grieving mother lost her 23-year-old son to an accidental overdose and told The Mirror she feels "like he was letting me know he is happy in heaven. That brings me some comfort, but I still just think it's weird." "I haven't seen anything since and I had never seen a ghost before," she continued. 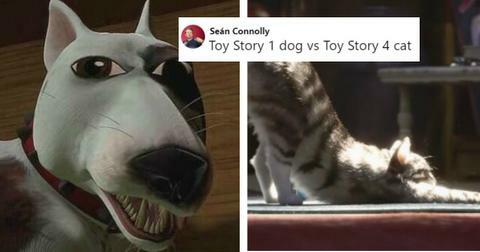 "I don't know what to believe. I'm still in a state of shock. Does it look like Robbie? Yes. I would love to see anybody else's cameras where people might look transparent. This is just weird," she went on to say. Ask and you shall receive, dear Jennifer. She's far from the first person to capture someone from the spirit world on a security camera. 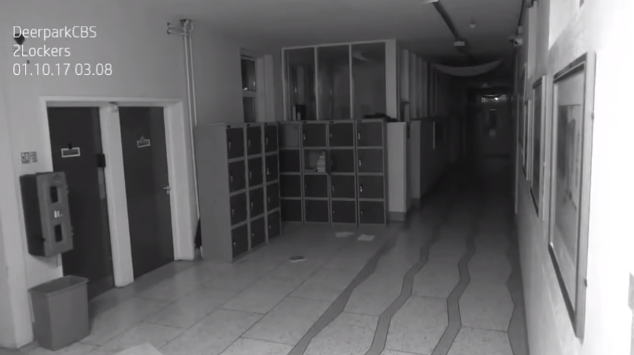 One high school in Cork, Ireland recently received a visit from beyond the grave and the camera footage freaked staff right out. Unlike Jennifer's son, this doesn't appear to be a friendly ghost, and the paranormal visit has all the tell-tale signs of your favorite horror story. 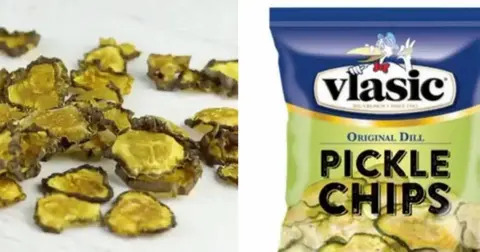 Honestly, it's terrifying to watch. First, there's a thunderous bang, then some eerie flashes of light. The events escalate quickly when a heavy set of lockers begins violently swaying back and forth, but only one locker door swings open, flooding the floor with books and papers. Could this be the spirit of a former pupil who haunts the hallways on the weekends? 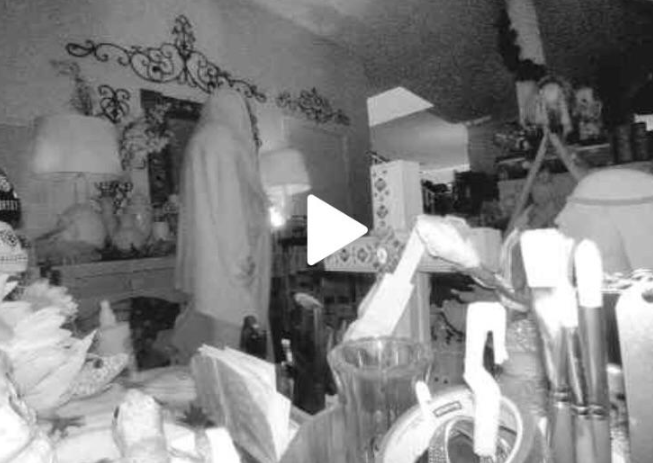 Another thoroughly creeped out mother caught a strangely clad figure on her security camera while she was home alone. According to the comments on reddit where it was shared, people can't decide whether it's the Reaper or a friendlier curious spirit. Her son-in-law, who posted this photo on the platform assures the internet that his MIL's a very religious old lady who doesn't know how to doctor images. Plus, she was in the same room while the footage was filmed. "She would have heard them enter through the door, which is to the left of this frame as she was lying on the couch in this same room," he explains. Then there's this family, who received a Nest alert saying that the security device picked up on someone talking in the garage. "Your camera thinks it heard someone," the creepy notification reads. 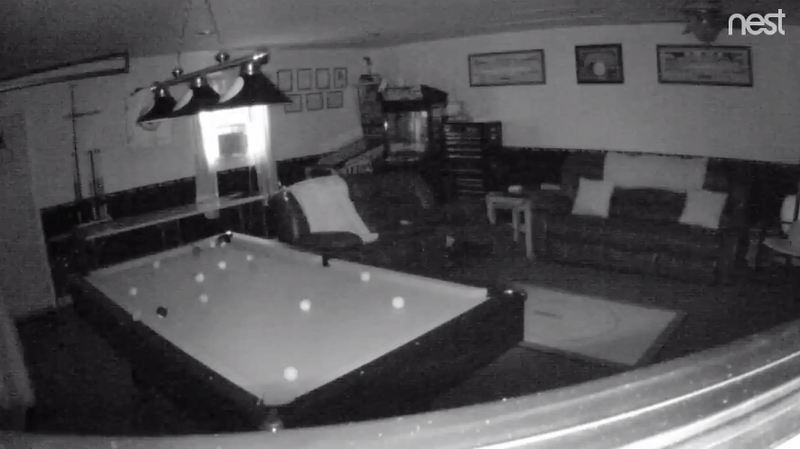 The actual video footage is even more terrifying than the alert and opens with billiard balls moving across a pool table on their own. Later, there's some sort of inexplicable sound that sounds neither human nor entirely like a machine. 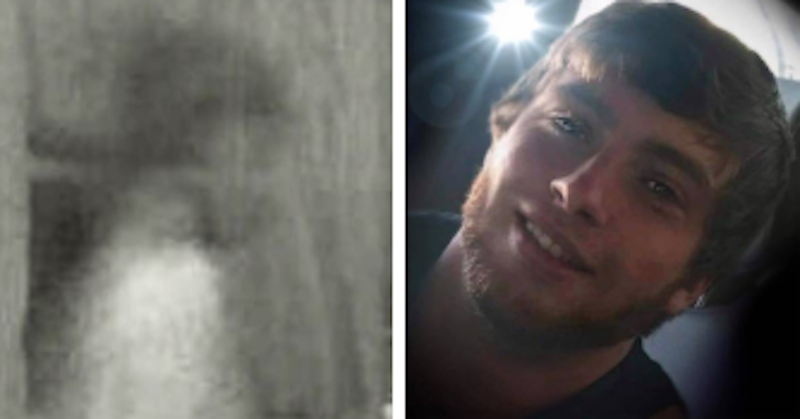 A wispy half-translucent figure much like the one Jennifer caught of her son can be seen moving from one side of the frame to the other. Well! Now that we've managed to thoroughly freak ourselves out, it's time to remember that these paranormal alerts aren't the worst possible outcome of a home security device. 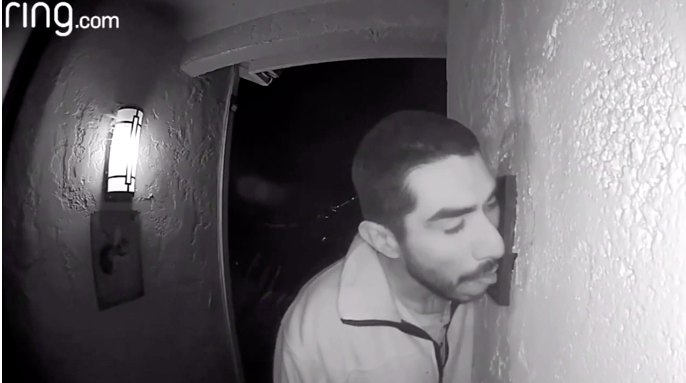 Police have recently been trying to track down an actual real-life man who was caught on camera licking the doorbell of a California home in the middle of the night for three hours straight. 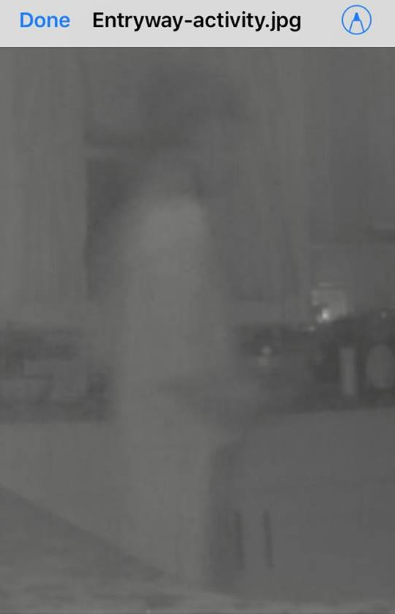 I guess we can all come to terms with having a friendly ghost as a roommate faster than we would accept an actual prowler on the loose licking our doorbell while the kids are asleep. But homeowner Sylvia Dungan is taking it in stride. "You kind of laugh about it afterwards because technically he didn't harm anybody, he didn't break anything," she told ABC. Life never gives you more than you can handle, we suppose?